A Bratt Pan is a versatile piece of equipment, which is able to perform up to eight cooking functions: braising, boiling, steaming, poaching, stewing,roasting, deep-fat frying and shallow frying. Bratt pans are typically used for producing large volumes of food and so are almost always present in large hotels, restaurants, hospitals and universities. 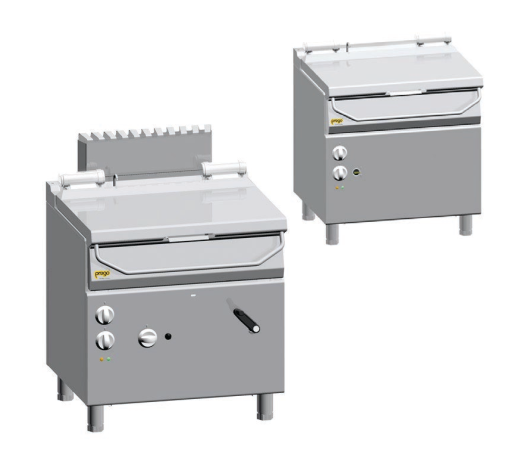 Deep, rectangular cooking pots with a counter - balanced pull down lid and electric or gas base. Constructed for heavy use and made with a stainless steel interior and exterior. Most pans are designed with a bottom that’s constructed of ½-inches. or 5/8-inches. carbon steel plate clad in stainless. Bratt Pan can be used for multi-function cooking of one product, such as browning-off meat with the pan set at a fry temperature with the lid open. The pan can be tilted a few degrees to drain fat away from food as it cooks, such as in griddling or braising meats. The tilt feature is very useful for emptying the contents out and is useful for washing the pan. Allow the unit to cool down. Scrub out the interior surface with a brush and cleaning detergent solution. Place a bucket near the skillet. Tilt the skillet to drain the cleaning solution.